The new FlexView Series from Middle Atlantic provides AV integrators with display solutions that offer strength, mounting flexibility, aesthetics, and user friendliness. A collection of display stands and carts ideal for corporate, hospitality, and education environments, FlexView models feature a slim profile, contemporary design aesthetic, and safety certification, offering hallmark Middle Atlantic strength and durability. 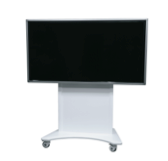 FlexView solutions feature the lowest profile display mount in the industry as well as a smaller base for unimpeded, up close display interaction. In addition, it enables mounting of larger displays than competitively-priced solutions currently available in the market, including most 90” screens with VESA 800 mounting or smaller. Models are available with electric or manual display height adjustment for options in ergonomics and flexibility. FlexView solutions are also available in stationary or mobile configurations with rugged casters that provide long-lasting use and seamless maneuverability, even when wheeling over door thresholds. FlexView options enable integrators to do more within a slim profile with features like the Lever Lock system for small component mounting and a locking easy-access door for quick maintenance. All carts and stands are integrator and end-user friendly with storage where it’s needed and useful options and accessories to provide more flexibility in customizing the solution to the application.